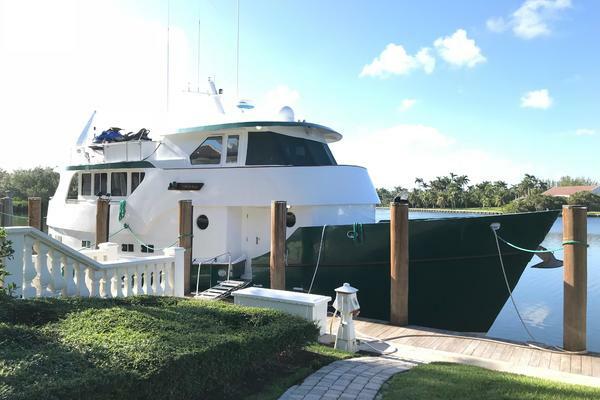 Owners are involved with a major remodel of their waterfront home, intending to "move ashore".... MIGRANT is very much for sale, an incredible value for those that look for the safety and the heft of a steel yacht, and the feel and conveniences of a home afloat. MIGRANT is a liveaboard trawler, truly built like a small ship: she was built in Corten steel by the Cammenga yard in Holland in 1967. Rebuilt, upgraded and modernized by her current owners in 2005, she has cruised extensively, including the Med, safely and in comfort. With one large owners cabin, a small guest cabin/office, nicely appointed home-style galley and head, MIGRANT is indeed a go-anywhere comfortable home afloat. Her Gardiner 6-cylinder diesel is an engine legendary throughout the world, offering a comfortable 8-9 knot cruise. At 8.5 knots cruise, with a consumption of 3.5 gph, she has a range of over 2000 miles. Please see details for lists and photos of extensive renovations and upgrades! Additional photos are available online for interested buyers, please contact the listing broker. MIGRANT is commissioned and launched for 2018. Her owners will be off for a short summer cruise, and MIGRANT is ready to go for her new owners. Come cruise New England, then take her wherever your heart desires! United Yacht Sales New Jersey would love to guide you through a personal showing of this 61' Cammenga North Sea Trawler 1967. 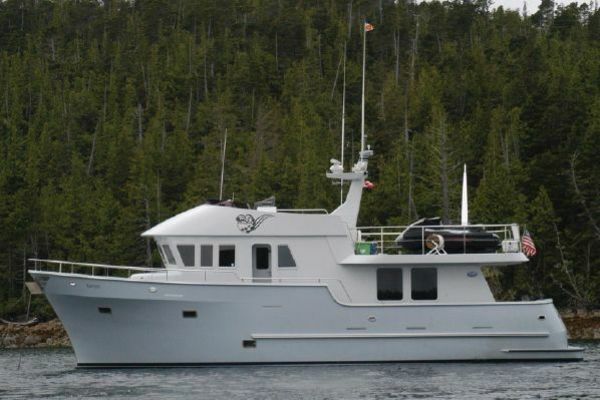 This yacht for sale is located in New Bedford, Massachusetts and priced at $449,000. For a showing please contact us by filling out the form on this page and we will get back to you shortly! MIGRANT was bought by her present owners in 2005 as a well-built "but needing repairs" Cammenga 61 steel trawler with the intent of doing extensive cruising as a couple. She was taken from the Chesapeake to Padanaram MA and then on to Lunenburg Nova Scotia. She underwent a total interior refit while at the Lunenburg Foundry. Her owners managed the project, living in Lunenburg for the duration of the project.As described by her owners:The entire interior was removed, down to bare steel, with the exception of the engine room. Inside, the forward end of the underfloor fuel tanks showed corrosion, and both were shortened. Most of the steel freshwater tank was removed and replaced with a new stainless steel tank (about 400 gallons). The forward part of the old freshwater tank was made into a gray water tank, and the old gray water tank was converted to a blackwater tank.In the engine room the insulation was removed and replaced. The generator was relocated from the lazarette to the port aft are in the engine room. Nothing was done to the Gardiner main engine, which runs flawlessly. All small componenets, filters, pumps etc were removed and overhauled or replaced as necessary.On the outside, the old teak decks were removed, exposing a fair amount of wasted steel decking. Virtually all the main decks were replaced including anchor windlass platform, and repairs to steel work made as needed. Any steel that was more than 10% wasted was replaced, including a very small portion of the hull. Pilot house to deck interface and stack-to-house interface were placed. The hull rubrail was found to be deteriorated rubber and was replaced with half-round stainless steel. Rail cap was removed and replaced with new steel flange, and a new teak caprail was installed when she returned to her home at the Fairhaven Shipyard.The teak main deck was fabricated and installed by TDS in 2006. No mechanical fastening and no bungs.The interior was designed to be a comfortable home for two, with a guest cabin. The galley had to have "the comforts of home", as did the bathroom/head with large shower, home-size washer/dryer etc.After sandblasting, all steel was painted and all exterior surfaces insulated. Extra insulation, SoundDown insulation and cork was used on the bulkhead between the engine room and living spaces. Cork was installed between the two layers of subflooring. All interior members were epoxy-coated (3 coats) after fitting and before installation. All electrical and plumbing is new. Glass in all the windows was replaced. The skylights and stainless steel opening ports are new.Interior woods are native North American Cherry, with Ash overhead beams. Wall coverings are vinyl.Extensive documentation and photographs of the refit work are available. Interested buyers may contact listing broker for additional online photos in higher resolution.Since her refit, MIGRANT has travelled extensively, including 7 summers cruising the Med (shipped across the Atlantic as deck cargo). She is comfortable, capable and ready to go much farther....MIGRANT holds a USCG Certificate of Documentation. GALLEY Located to starboard just below the main salon, it has beautiful custom cherry cabinetry and custom Corian countertops. Gardiner 6L3B six cylinder diesel, 180 hp. Approx 13,000 hours. Top end overhaul at 10,000 hrs. ESI fuel polishing and transer system, can polish any tank individually or as fuel is transferred among tanks. All fuel piping painted red for identification. Generator: Northern Lights 12kw in soft soundshield, new 2008. Approx 3200 hrs. Dedicated 12v genset battery. Racor 500MA fuel/water diesel fuel filter. Panneltronics custom electrical panel in pilothouse with full circuit breaker system for 240/120vAC and 24/12vDC, voltmeters, selectors. HRO 10-600 watermaker, 220vAC, 23gph. Overhauled 2005. Not currently operating. CruiseAir 220vAC units, (1) 30,000 btuh and (1) 24,000 btuh, overhauled 2005. CruiseAir digital controls new 2005.